Join the discussion on our forums! Come discuss E.M.P. Operative over in our dedicated E.M.P. Operative discussion topic. "I said this looks like a job for me So everybody just follow me 'Cause we need a little E.M.P. 'Cause it feels so mechy without me…"
This useless trash doesn't help even in a mode where 90% of decks run Mechs. This card basically is a worse Big Game Hunter. In order to gain enough tempo to justify running this, 90% of the time you would want to wait to kill a mech with at least 7 attack anyway. To make this card even more flavorful and to actually make it worth existing it should silence and destroy a mech. It would make it situationally better than BGH for mechs more of the time. Basically this is one of the most disappointingly pack filler cards that I wish was better. Pack filler cards have improved vastly from the days of Worgen Greaser, but they could still be even better. It was most likely designed as a safeguard just in case Mech decks were too powerful. Now we know that it wasn't really needed. Overcosted. 4 seems better, make it a 3/2 body. Yeah, was thinking the same thing. Most of the time you want to play EMP, it would most likely be on a larger mech, or perhaps a smaller one that has magnetic upgrades. Also, at least BGH can still hit Omega Defender which isn't a mech. Think I'd rather stick to BGH in most cases. Bad card, but great flavor text. another card for my "thicc rogue"
Why they use Motoko Kusanagi in the art though? Is it Warcraft or GITS game? Kusanagi doesn't have long hair. And she is not a 3/3 beleive me. think this card is pretty bad. 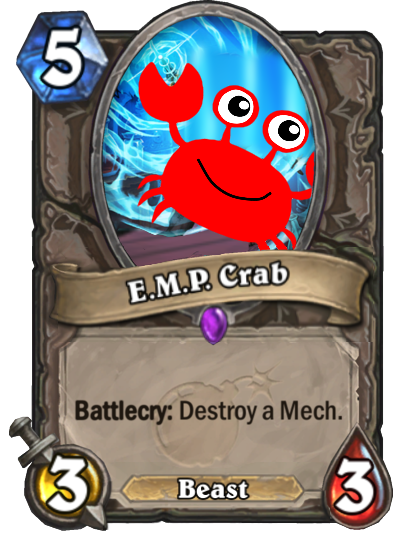 Compared to crabs this card is much much worse as a 5 mana 3/3. 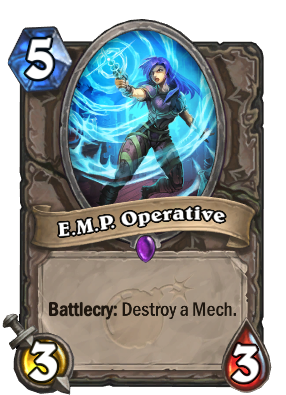 I highly doubt over half the meta will revolve around mechs for this card to be good. It's a tech card, simple as that. From its stats, I only see it seeing play in a meta where one of the Tier 1 decks is a mech deck, for decks which have a bad matchup against it. How much play it sees depends heavily upon the prevalence of mechs and mech decks. Though the comparisons to Crabs are mildly lacking in one key area: Crabs gain stats from destroying the minion they are targeted to kill. Other targeted removal minions don't. Tech card. It's an option in case mechs become so out of control that two silences isn't enough to deal with them. Don't worry guys, I've got you covered!